David Thomas Moore (ed. ), Dracula: Rise of the Beast. Abaddon Books, 2018. Pp. 308. ISBN 978-1-78108-666-7. $15.99. 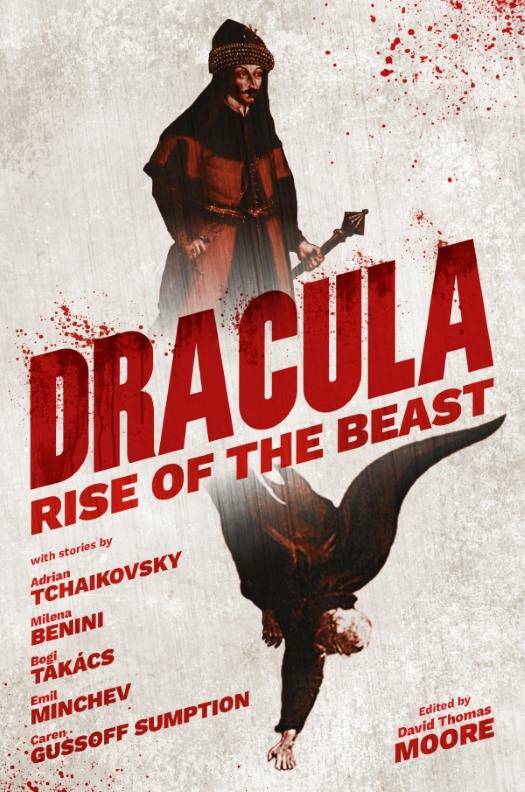 Dracula: Rise of the Beast is an interesting and almost undefinable book. It is not a conventional fiction anthology, as all of the stories presented are held together through a joint framing device, but neither is it a mosaic novel, as the stories do not altogether cohere. That said, it’s a fascinating collection that talks back—not just speaks, but explicitly talks back—to Bram Stoker’s classic 1897 novel. Stoker’s Dracula was a figure as exoticized as he was threatening, playing on a number of English cultural anxieties ranging from immigration and anti-semitism to homosexuality and women’s roles in the new industrialist age. Moore and his stable of writers here—Adrian Tchaikovsky, Milena Benini, Bogi Takács, Emil Minchev, and Caren Gussoff Sumption—respond not just to the fictional figure and his historical counterpart, but to the cultural conversations around him as well. The second story, Adrian Tchaikovsky’s “Noblesse Oblige”, takes place a century later and includes excerpts from the journals of Erzsébet Bathory. Bathory is sometimes known as “the Bloody Countess” in real life and if historical accounts are true, she was one of the most prolific serial-killers in history; most famously, although this story was concocted years after her death, she enjoyed bathing in the blood of beautiful young virgins in order to stay forever young and beautiful herself. In Tchaikovsky’s version, a young Bathory falls in love with Dracula and takes awful measures to become like him. In some ways this is the most conventional story in the book; given the efforts by historians in recent years to revise and reclaim Bathory’s story—surviving manuscript evidence suggests that the Hungarian Palatine Thurzó was scheming for a transparent land-grab of the Countess’s property—a feminist revision of the story would have been welcome. Milena Benini’s “A Stake Too Far” consists of a mix of letters, receipts, and accounts from the late eighteenth century. The story in the background here is the rivalry between Vlad, the heroic and elegant vampire beloved of his entourage, and his brother Radu, a stinking and starving remnant terrorizing the countryside. Significant parts of the story are told from the point of view of Magdalena Hranić, a widow with skill in healing as well as identifying the supernatural, since her husband was killed by Radu. Excerpts from the letters of unidentified authors argue that accusing her of witchcraft would lead to her loss of property and the accompanying growth of wealth for others, in the sort of cynical abuse of women that history is increasingly trying to reckon with, and reconcile. Working with the local priest, Vlad and Magdalena kill Radu, providing one of the only happy endings in this collection. The final story, Caren Gussoff Sumption’s “The Women”, takes place from the perspectives of three different women. Olivia Fogg Cruthers writes letters tracing the search for her missing father and his research into Matthias Corvinus, “The Raven King,” in 1899, in the course of which she befriends a young Romany woman named Mera Szgany. Lolo is a young Romany woman at university who writes long letters home from London to Bucharest and engages in a brief affair with Matthew Corbin, one that goes horribly wrong. Dani is a young transwoman, and her story is told through blog entries meant to chronicle her transition before it starts as a chronicle for her search for The Raven King, the sire of Dracula who has menaced her family for generations. These three stories are meant to reckon with the problematic portrayal of the Romany in both Stoker’s novel and its adaptations (though it could be argued it reckons as well with their broader portrayal in contemporary popular culture). In many ways, it also reckons with the misogynist culture of the Romany, in which forced marriages and purity laws heap personal abuse onto social abuse. Adding further intersections through Dani’s transition and her search for her own truth speaks to contemporary concerns as well as playing with the “chosen one” trope: What happens when the girl who is meant to save your people isn’t a cis-girl? Dracula: Rise of the Beast may not work as a whole, necessarily, but each of the pieces that make it up play with the popular figure in interesting and revealing ways. While the authors’ willingness (or not) to push back against established narratives and characterizations varies, they all bring thoughtful engagement to both Stoker and Vlad Tepes. I particularly recommend this book to aficionados of vampire literature, who will likely get more out of it than other readers.